Eschewing the common wisdom of setting out your meal horizontally, Outback Steakhouse launches new Towering Steaks, which stack up their various components vertically. 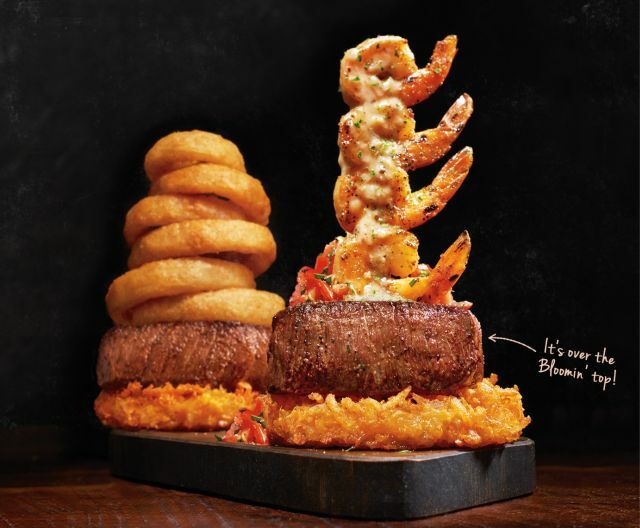 - Towering Beer-Battered Onion Ring Filet - A stack of beer-battered onion rings sitting atop a seasoned filet, which itself is perched on a hash brown cake. - Towering Grilled Shrimp on the Barbie Filet - Featuring the same stacked filet and hash brown cake but topped off with an upward pointing skewer of grilled shrimp. Beyond the gimmicky visual appeal, the new promotion actually leaves you to deconstruct your tower before eating... Unless you decide to eat everything in order from top to bottom. Of course, if they really wanted to do it right, they should also stack your utensils into a tower to match. The new plates are available for a limited time at participating locations with prices starting at $15.99 (may vary).